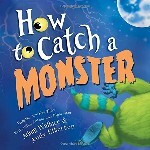 How to Catch a Monster is about a boy who is going to play a Ninja Master in his school play. He’s feeling so brave he takes his costume home to practice being a Hero. He wants to scare the monster living in his closet. When he opens the door and the two come face to face, it’s unforgettable, and oh so humorous. The interaction between the young Ninja and his closet monster will have you laughing out loud. Children’s author Adam Wallace knows the way to a young reader’s funny-bone, and he’s proven it with each story in his How to Catch series. Wallace pairs his imagination, humor, and rhymes with Andy Elkerton’s vibrant, unforgettable illustrations. These gentlemen are a match made in publishing heaven. To Catch a Monster will catch you and your parents by surprise. Trust me when I say, it will have you in stitches. Coming October 2017: Only You Can Save Christmas.